Lennar Corporation is a major U.S. housebuilder with heavy exposure in the bubble regions, including Florida, Arizona, Nevada, Colorado, and California. They are a diverse builder with products ranging from smaller townhouses to large McMansions. With 13 developments currently under construction in the Sacramento region, they will be heavily impacting the resale market here for years to come. One of Lennar's upper middleclass developments is called Ironcrest at Fiddyment Farm, which is located on the western edge of Roseville in Placer County. 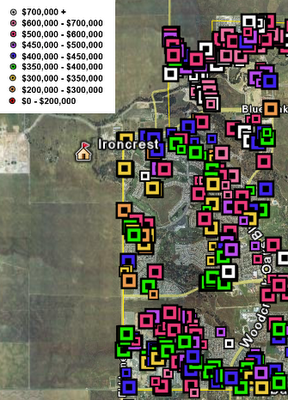 Ironcrest consists of houses ranging from the modest $464,000, 2200 square foot "Dynasty" model, up to the ostentatious $640,000, 3800 square foot "Imperial". 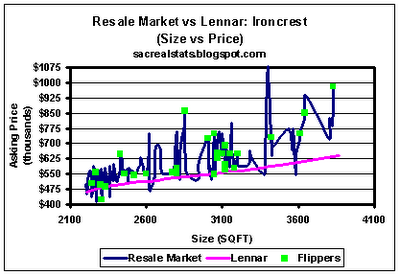 Like the other housebuilders in this series, Lennar has under-priced the resale market at all levels. 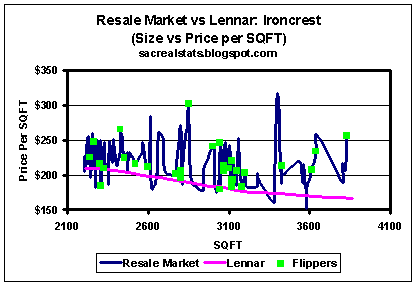 43 resale houses (30%) are priced higher than the highest-priced Lennar house, and only 7 resale houses are priced lower than the lowest-priced Lennar house. 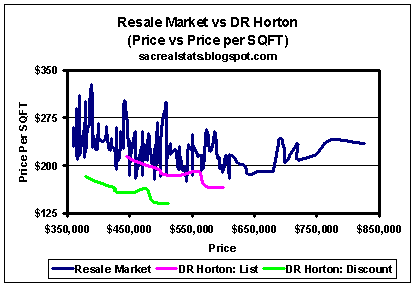 In addition, the resale market is behaving irrationally with respect to price vs. price-per-sqft. Typically, as you move up the housing price scale, you would expect a lower price-per-sqft. In this development, the exact opposite is true. This is not a trend that is likely to continue. Sadly, my rational flipper assumption has failed the test. There is clearly no tendency for flippers to price to the market in order to lock in previous gains (or to get out before a loss). The only remaining assumption is they are pricing based on what they owe, and success will be difficult while Lennar is undercutting them. Indeed, 16 of the 32 flippers are currently in trouble. That puts us dangerously close to massacre territory. Love the post. I was actually just out in Sacramenot last week visiting my folks. 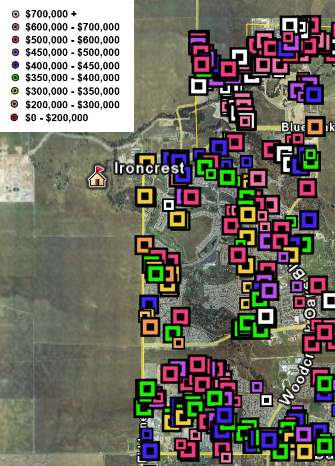 Man, your real estate market out there is a bit over inflated eh? But who am I to talk? I loved the auction article a few posts back. what do you guys think we do with sewage....beam it out of here Scotty? 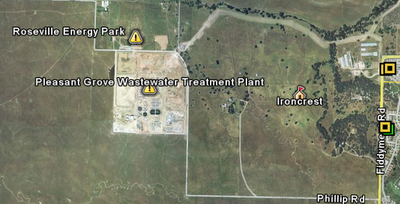 Do you know how to find the dividing line between Land Park and South Land Park - the sewage treatment plant. Used to stink up the place 1-2x a year. I wouldn't be buying a near million dollar McShitbox near a sewage plant. That aerial photo really demonstrates the Land shortage doesnt it ??? I actually think this series of priced to sit, flipper massacre is the best of the bubble blogs. I'd anticipate the farms next to this will soon become the "affordable" housing subdivision. Excellent analysis, as always. 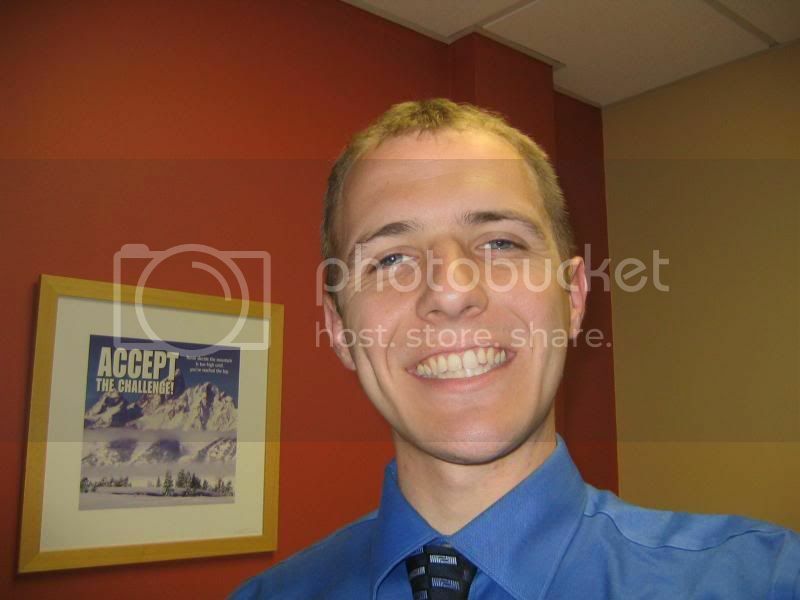 You're the Stratfor of the Sacramento Real Estate Scene! No, we burn it in the biosolids-fired power plant built next door. Yeah, that land-shortage argument was the worst one they had. Anyone flying into SMF could tell immediately there's no land shortage. 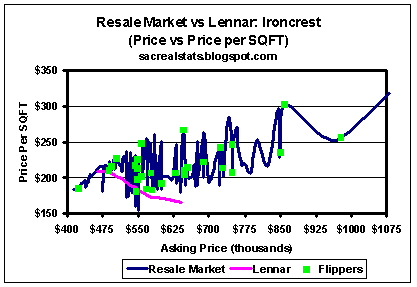 I actually think this series of priced to sit, flipper massacre is the best of the bubble blogs. Thanks for the kind words. When I started this series, I didn't really know what the data would show. In hindsight, it makes perfect sense that the builders would be at a serious competitive advantage vis-a-vis the resale market. Hundreds of these resellers are toast. Even after two years of dire predictions, I never thought we would see this level of carnage. I live in a centex beauty in Charlotte. In 2003 I paid 150K even for a new 2723 sqft + 2 car garage, on a 1/4 acre, 12 miles from center of town, in a great area, surrounded by $$$ homes with no neighbors across or behind - ever. From 1998 - 2002 Charlotte prices were consistently $80+ per sqft as the builders were doing more on site and less prefab. They went prefab and prices dropped like a rock. centex is one of those that perfected that into an art IMHO atleast in charlotte NC. I cannot wait for your spot light to hit centex and I am certain they will go that route. BTW they already ahve in the merced area. Fox and Jacobs = centex's cheap line. Pre fab cookie cutter. House gets put up in 2 days with prefab sections nailed together. Solid house BTW and very very quick. Definetly going to chase the market down. You know why Cow_tipping. Cos Cow tipping is like condo flipping. Sooner or later the cow is gonna get ya. Those new subdivisions make my skin crawl. But I certainly can see the appeal for the fertile woman. By the way, I noticed this in their brochure, page 4, under "Examples of Great Taste": GFI electrical outlet circuit. I think the uniform building code is chock full of great taste like that.